Plum® Fall Protection Clothing for Hospital & Home Healthcare Safety - Plum Enterprises, Inc.
Freedom with Safety at Home and in the Hospital Starts with Plum® Fall Protection Clothing for Fall Injury Prevention for All Ages. One in three community-based seniors will sustain at least one fall per year and that 50% of these individuals will suffer a significant injury. Injuries pose a significant burden in terms of loss of life, reduced quality of life, and economic cost. Other suffering includes disability, loss of confidence in physical and functional abilities, fear of falling, increased social isolation, and increased dependency on caregivers, loss of mobility, and long-term institutionalization. Each year as many as 1,000,000 people in the United States fall in the hospital. A fall may result in fractures, lacerations, or internal bleeding, leading to increased health care costs. ProtectaCap® is ideal for hospital fall injury prevention for fall risk individuals. Plum’s ProtectaCap® fall protection helmets Plum’s custom fit as if made just for you. ProtectaCap® provides a safe, secure fit that will not add weight, is fully ventilated and encased in cotton blend fabrics for comfort both day & night. Plum’s ProtectaCap+Plus® advanced falls safety helmets are engineered with superior varied-cell technology and designed with a comfortable lightweight ergonomic fit. Sporty above-the-ear style provides enhanced forehead & temple protection. ProtectaCap+Plus® has been successful for post-cranial surgery protection. Plum’s® ProtectaHip® is the original, award-winning hip protector with the best and longest track record for safety, comfort & money-saving durability. Hip fracture prevention from falls is a major concern for older adults at home and in healthcare facilities. Plum’s® ProtectaHip® Undergarments are engineered for superior safety, but designed for comfort. ProtectaHip® is double-lined with 2 layers of the highest quality of cotton interlock or cotton interlock and attractive stretch lace. Incontinence-friendly ProtectaHip® Front Snap™ has convenient front snaps and gentle elastic at the leg to prevent leaking. Plum’s® ProtectaHip® Pads, that expand in size with the size of ProtectaHip® Garments, are secured within hidden panels, with perfect placement over the greater trochanter to protect against the 3 sites of hip fractures: intertrochanteric, transcervical and subtrochanteric. ProtectaHip® is easy-care wash and dry without removing the Pads. Plum’s® ProtectaHip® Active Lounge Pants™ and ProtectaHip® Active Lounge Shorts™ are engineered with Plum’s® superior ProtectaHip® Pads and designed in comfortable wrinkle-free micro-polyester that wicks away moisture and is ideal for all climates. ProtectaHip® Pads, secured within hidden panels for proper placement over the greater trochanter are tucked behind stylish slash pockets. Elasticized waist and self-fabric drawstring allow for easy on and off. 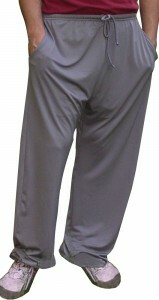 ProtectaHip® Active Lounge Pants™ has gentle elastic at the cuff to adjust to all heights and prevent tripping that can lead to falls. Plum’s® ProtectaWrap® completes your fall injury prevention with protection for your extremities, the third highest site of injuries from falls. Plum’s® ProtectaWrap® Adaptable Extremity Protector provides superior impact absorption for protection against bumps, bruises and fall-related injuries. ProtectaWrap® custom-fits knees, elbows, shins and forearms with superior impact protection where you need it. ProtectaWrap® pads are sturdy, dependable and unbreakable, yet conform comfortably to the body. ProtectaWrap® is a fully adjustable soft splint that provides customized compression and range of movement to absorb stress to help prevent injury and to promote healing post-injury. “Our patient is in her 80’s and needed head protection, as she falls quite frequently. She would not wear a hard helmet; her family didn’t think she would wear any helmet. Our patient and her family loved the ProtectaCap® right away. She has Dementia, which has also affected her eyesight and had just suffered a serious head injury from a fall. But she loves ProtectaCap®, and doesn’t want to take it off. She falls all the time and does not get hurt when wearing ProtectaCap®.